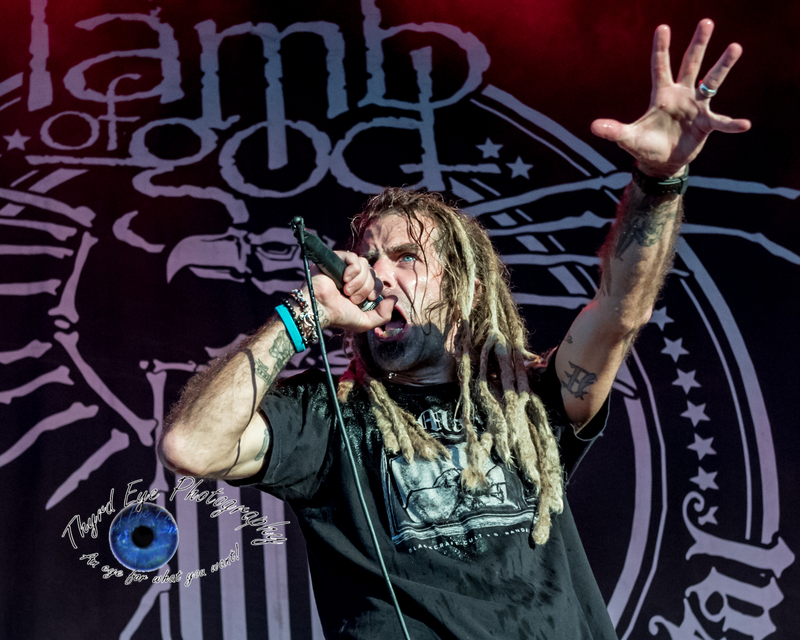 Lamb of God performing in Saint Louis at Hollywood Casino Amphitheatre. Photo by Sean Derrick/Thyrd Eye Photography. 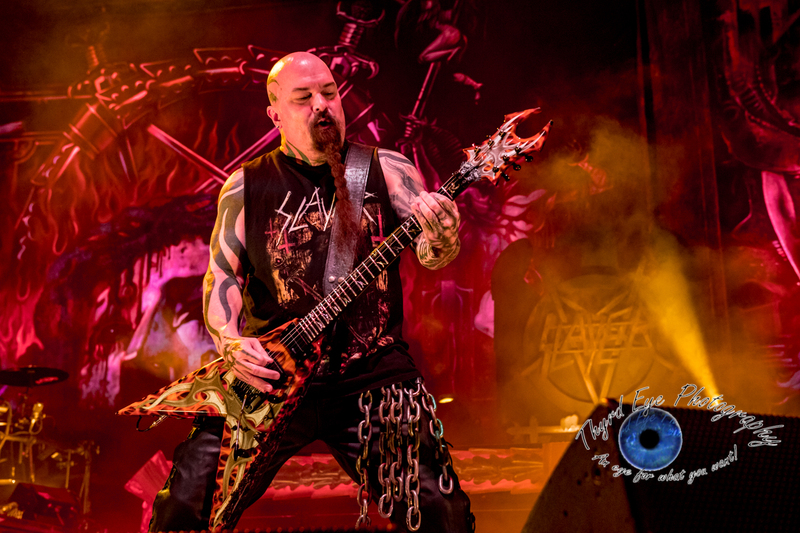 Thursday night marked an end of an era at Hollywood Casino Amphitheatre as thrash metal masters Slayer closed out their Saint Louis stop on their farewell tour with a fiery set. Slayer is in the middle of a final mega world tour to give their fans one final chance to see one of the Big 4 metal bands in action. (Big 4 – Slayer, Anthrax, Megadeth, and Metallica) Actually, for this tour there are two of the Big 4 acts as Anthrax is along for big send off. In all, five bands (Slayer, Lamb of God, Anthrax, Testament, and Napalm Death) are on this bill creating a sort of Slayer-fest, if you will, with a total veteran lineup. Slayer performing their final show in Saint Louis at Hollywood Casino Amphitheatre. Photo by Sean Derrick/Thyrd Eye Photography. After a 30 minute set from Napalm Death to set the tone of the evening Testament came barreling out with a tight 30 minute set that included lots of smoke, super fast shreds by guitarist Alex Skolnick and Eric Peterson, and epic vocals from Chuck Billy (who was also rocking a mean air guitar). 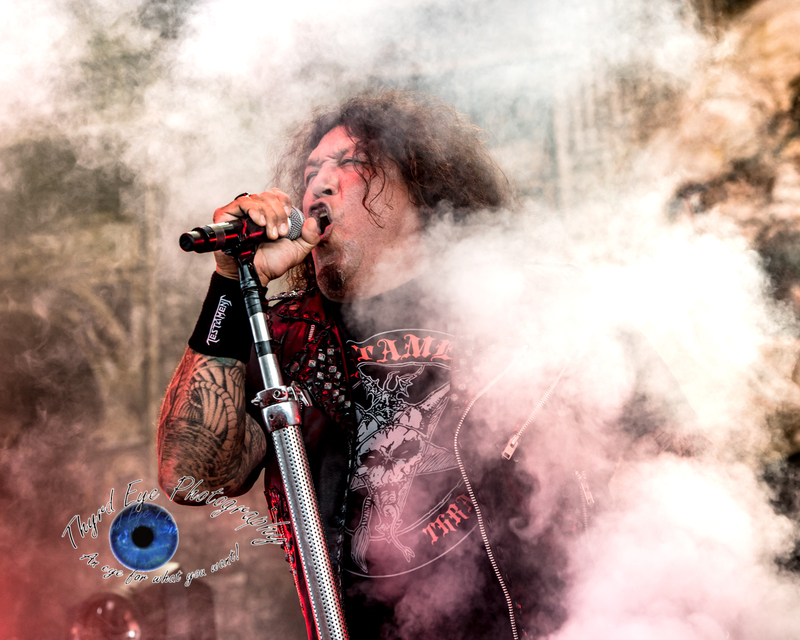 Chuck Billy of Testament performing in Saint Louis at Hollywood Casino Amphitheatre. Photo by Sean Derrick/Thyrd Eye Photography. Testament will start recording their twelfth studio album after the tour with Slayer concludes. Anthrax was next with a far-too-short 35 minute set. The other member of the Big 4 on the tour had an epic performance from start to finish, sounding as spot on as you can in a live setting. 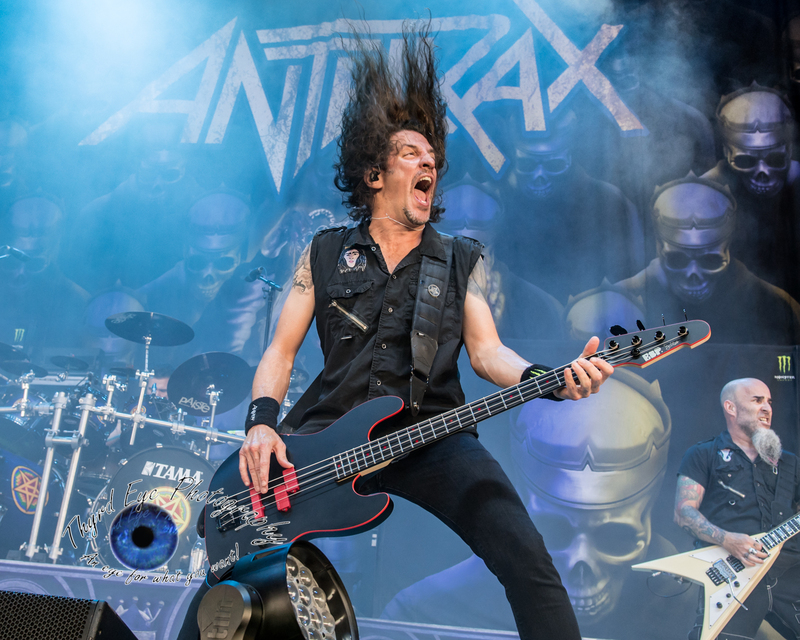 Anthrax performing in Saint Louis at Hollywood Casino Amphitheatre. Photo by Sean Derrick/Thyrd Eye Photography. Bassist Frank Bello was his usual super-intense self (a treat for photographers), and the rest of the band (vocalist Joey Belladonna, guitarists Scott Ian and Jonathan Donais, and drummer Charlie Benante) slammed through a seven song set that started with “Caught in a Mosh”, and included “Got the Time” and “Antisocial” before closing out with the epic “Indians”. 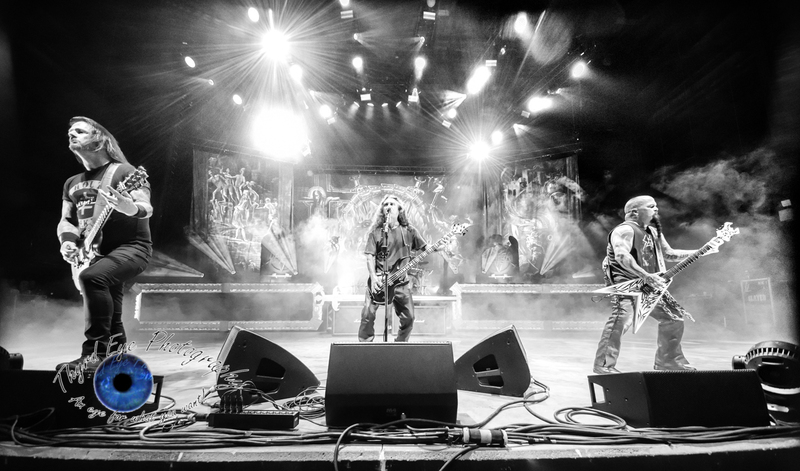 Lamb of God had the dubious honor of playing face first into the sun, but they didn’t slow down at all. In fact, some could argue that was what gives vocalist Randy Blythe his seemingly unending boundless energy. As the “newcomers” of the bands on this tour, Lamb of God didn’t have to prove anything, yet they performed jut like that with an impressive set . But the main reason nearly everyone was there was for Slayer and their final performance ever in Saint Louis. I have seen Slayer many times, from the Clash of the Titans tour in 1991 with Anthrax, Megadeth, and Alice in Chains to their 2016 appearance at The Pageant during their “Repentless Tour”. 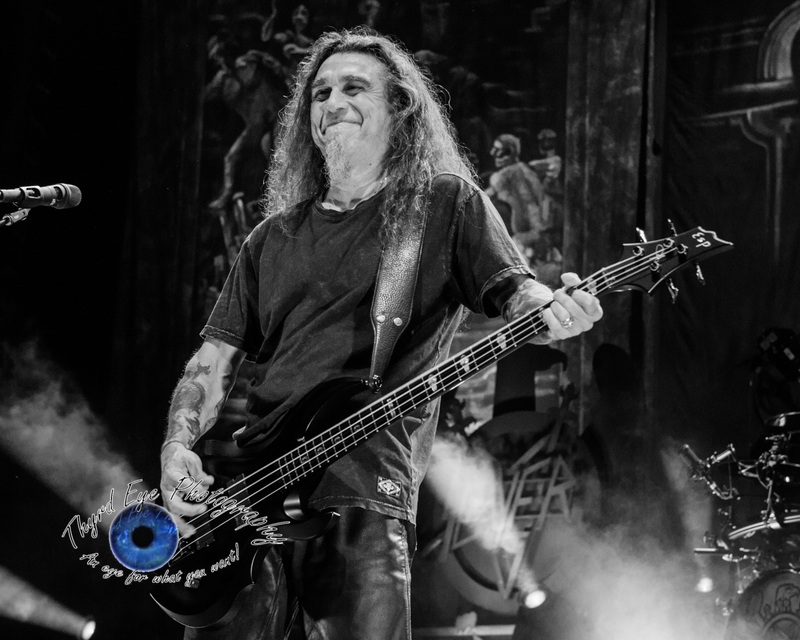 And while some things have changes over the years (most notably bassist/vocalist Tom Araya’s medically induced headbanging restrictions – if you saw them 30 years ago you understand how hard that must be for him) their speed hasn’t. Actually, I think they (Araya and guitarist Kerry King, along with guitarist Gary Holt who replaced original the late guitarist Jeff Hanneman, and drummer Paul Bostaph) sound better now than when I first saw them in 1991. Don’t get me wrong, I think they have always sounded tight at the shows I have seen and always thoroughly enjoyed watching Hanneman on the axe, but the fuller enriched sound, the dynamic of it, the spectacle of the show, everything seemed right Thursday. They totally owned the show. Whether it was the opening chords of “Repentless”, the dynamic chord changes and melodic rendering of “Seasons in the Abyss” or the fire engulfed “Hell Awaits” the band was relentless in their attack on the sights and sounds engulfing the amphitheatre. The sonic assault on the senses was precisely what the fans needed for a fond send off for their favorite band. While many final tours are, unfortunately, hit or miss at best, this was a bullseye all the way. One last hurrah for fans of the titans of thrash metal. If you get a chance to catch one of the final handful of shows on this leg you should do so, or kick yourself later for missing this legendary band one last time. Be sure to check out the gallery of images after the setlists below. Testament performing in Saint Louis at Hollywood Casino Amphitheatre. Photo by Sean Derrick/Thyrd Eye Photography. Separated at birth? 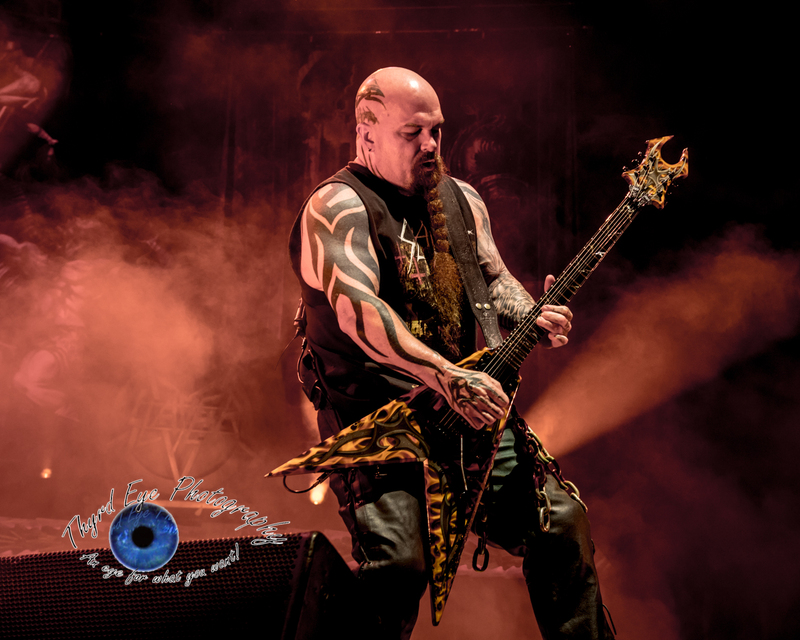 Slayer’s Kerry King shredding behind his doppelganger Scott Long (one of the great guys who protect us photographers in the pit) as Slayer performs in Saint Louis at Hollywood Casino Amphitheatre. Photo by Sean Derrick/Thyrd Eye Photography.